PLAYBACK is a five projector slide and sound installation that explores the relationship between my family snapshots and media imagery. A fifteen minute sequence of 120 slides covering an entire wall is arranged chronologically using imagery from World War II to the Los Angeles riots. Included are images from the Holocaust, the Vietnam war, the 1960s civil rights and anti-war marches and protests, the 1970s hostage kidnappings, and the Gulf War. My family's images from the same periods are interwoven with this media imagery using dissolves of varying lengths. 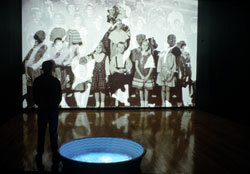 A children's wading pool sits on the floor with continuously dissolving images of children jumping into a pool projected into it. For the sound component, live radio is used. Pre-programmed stations are scanned alternating between music, news, and talk shows-the audio equivalents of he types of imagery used. 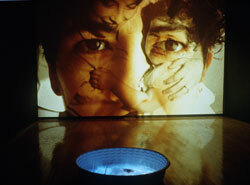 PLAYBACK was commissioned by the Southeast Museum of Photography in Daytona Beach, Florida for the traveling exhibition Betrayal of Means/Means of Betrayal. It has been exhibited at Tufts University Art Gallery, Medford, MA; the Fleming Museum at the University of Vermont, Burlington; Breda Fotografica in Breda, the Netherlands; and the Manchester Craftsmen's Guild, Pittsburgh, PA.